Gain an internationally recognised cyber security qualification from anywhere in the world, at a time and pace that suits you. Want to obtain an ISO 27001 qualification but can’t afford to put your life on hold? IT Governance’s distance learning courses provide professionals across Asia-Pacific with the flexibility to study in a way that suits your lifestyle and commitments. Break free from the commitments of traditional training – courses can be delivered to anywhere across Asia-Pacific, all you need is an Internet connection. Set your own timetable and schedule your study around family or work commitments. Repeat modules or skip those that cover familiar topics - with distance learning, you’re in charge. Avoid the costs associated with traditional courses, such as travel and accommodation. The starting point for prospective ISO 27001 project managers and auditors, this introductory course introduces the ISO 27001 standard and provides an overview of the key implementation activities. 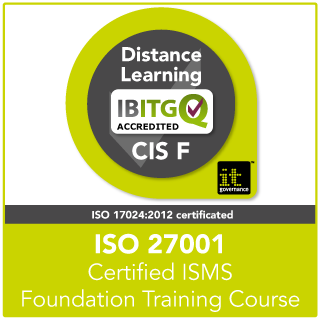 This fully accredited, practitioner-led distance learning course equips you with the skills to lead an ISO 27001-compliant ISMS (information security management system) implementation project. Why study with IT Governance? We’re the global pioneers on ISO 27001 and led the world’s first successful ISO 27001 certification project. Since 2005, we’ve trained more than 7,000 professionals on ISMS implementations and audits worldwide. All our training courses are designed by experts and delivered by experienced ISO 27001 trainers and consultants. If you would like to find out more about IT Governance’s distance learning courses in Asia-Pacific, contact our experts.